The Hour is upon us all. At least that is the way we Muslims should always be perceiving the Hour. None of us knows when it will arrive, be it the Final Hour or our own demise. The previous āyah, from suwrah al-Anbiyā’ demonstrates the sense of urgency that man should have but often doesn’t. This is mainly due to ghaflah, or heedlessness. Interesting to note as well: This āyah does not distinguish between Muslim/non-Muslim. In other words, both Muslim and non-Muslim alike can fall victim to heedlessness – we must be vigilant in watching against it. No time to waste – strike while the iron is before the Fire is hot! Taqwā, in a sense, is a type of self-defense or self-preservation system or technique to ward off destruction by placing something between yourself and that impending doom. For us as Muslims, that pending doom is the ‘adhāb of Allah – the Divine Chastisement. To summarize, taqwā is a means of protecting and guarding oneself from Allah’s Divine Punishment. Second part of the khutbah we’ll examine another aspect of the taqwā /akhlāq relationship and that’s wara’. In order to affect change in ourselves we must first, turn to Allah and ask Him to change us, to make us better Muslims. To make sincere istigfār [asking for forgiveness] and tawbah [repentence]. The second is then to take stock of our mental, physical, and especially, spiritual selves, and seek means to rectify them. In the science of Tasawwuf, one of those means is termed wara’ [ورع]. Some helpful translations would be: scrupulousness, conscientious, critical thinking, fastidious, heedful, honest, meticulous, moral, particular, precise, rigorous, principled, and so forth. In the Arabic language, the dictionary meaning of wara’ itself means: to pause, give examination, or hesitate. The use of the word taqwā in this hadīth shows again that taqwā is that self-defense mechanism – in this case, defending oneself from Allah’s Punishment by avoiding “grey areas”. That is the hājiz – the barrierو that at-Tabrīzī spoke of earlier, that can ward off the Chastisment of Allah. For the believer, wara’ becomes a habitual act of being scrupulous, or heedful, which negates ghaflah, or heedlessness. So we should busy ourselves with what concerns us most – our own demises; our families; our children; our health; our wealth; our communities; our character. In one week alone, Allah showed us clear signs of the Hour, Big or Small: Michael Jackson. Ed McMahon. Farrah Fawcett. Billy Mays. Celebrity is no guard from the Hour. Big or Small. Contemplate on it – prepare for it. Do not wait to give that single dirham on your deathbed – give it now, in sha’Allah. May Allah make us the people of ‘irfān, the people who realize and actualize Lā ilāha illa Allah in their public and private lives. Amin. And from knowledge that has no benefit. O’ Allah!, I seek refuge in you from all four of these! Dear respected brothers and sisters in Islam, I greet you today with the greeting of Paradise, “as-Salaamu ‘alaykum wa rahmatullahi wa barakaatuhu”. How do we react to advice when we’re given it from those we know? What about advice from Allah of His Messenger [s]? Are we as quick and eager to alter our character, our awareness as much as we think we are? A case in point is the imagination that many Muslims have, thinking that we would have loved to have been with the Prophet [s] during his lifetime. What we do not realize is this: we would have learned and been told a great many things about our character that we may have found hard to swallow. And like it or not, we would have to imbibe this for there would have been no other arbiter to take one’s case to in the face of the Messenger critiquing your character. Taking stock through realizing we are all going to meet Allah on the Qiyāmah and that there’s no putting it off is one of the perennial duties of a Muslim. Constant [though not obsessive or fatalistic] thought and reflection about our own demise will help us weigh and consider our lives in where our standing is – and with a sense of immediacy that we’re not entitled to nor promised any time. The word hisāb is a continuing theme in the Prophetic and Qur’ānic dialog. Studying its meaning and consequences can provide deeper insights to our lives and practices as Muslims. Keeping an eye on what we’re striving for is a means of recalibrating our Islam – just like a machine, which needs constant recalibration to keep running smoothly and on track. It is also the means of seeking Allah’s protection from the deception that Shaytān is always whispering to us with: that our actions will somehow justify our deeds. Let us ask Allah to make us of those who strive for Him and for upholding the honor and the legacy of His Noble Prophet. We’ve talked about responsibility and being aware of the Hour and the hisāb, but how do we go about changing out character? I mention this as it is indicative of how we often look at life as being entitled or promised so many things. We ask Allah to allow all of us to take this sound advice to heart. We also have to ask ourselves, what do we spend our time doing and with whom do we spend our time with? This is especially as it relates to children. We live in the “Hyper Age” – not hyper as in spastic [though a clear symptom] but hyper in terms of excess. Modernity lacks the ability to take stock of itself. This is because it has put the individual as the ultimate arbiter of truth: moral truth, cosmological truth, legal/ethical issues. Islam puts that back in its place: we can offer this to the rest of the world if we can get ourselves correct. But above all, we can never hope to affect change in the world without affecting change within ourselves. Something all of us, in sha’Allah, can do. We should keep in mind the kulliyāt of Islam. In other words, what the Qur’ān, Sunnah, etc., is trying to “get at something” in relation to the human being. While we don’t accept Darwin’s theory of evolution we do allow for the evolution of human beings in their Islam. Be tolerant with each other and when calling people do din al-Haqq. The times we live in are full of doubt, confusion and heedlessness. Many people, having capitulated to the false demands of science, have decided to bury their heads in the sand. Many varieties of philosophies abound about the nature of reality but none of them possess even the merest ability to launch out on this endeavor. Science is not wholly equipped to look for God, though some of God’s Signs [آيات] are detectable by science. One of the signs of this heedlessness is over the argument about the Hour, which for some has become either a joke or an unquantifiable determinacy. One of the flaws that science has is that while it is capable of looking out, it cannot look in. Even when applied in microscopic terms [which may seem like looking inward but in reality it is not], it is still looking out; a “horizontal” activity. For Islam, the phenomenon of Revelation is a top-down one. One may even say that Allah’s relationship with the creation is “vertical”, a top-down relationship. Thus, for man, if he is to know his Lord, he must reflect, ponder, and use his heart and brain in tandem. While this process does involve looking out to the cosmos or up at the heavens or at the wonders in creation, ultimately the human being must turn inward if s/he is to understand their role in relation to God. “There is a morsel of flesh in the body; when it is sound then the body moves to soundness by it – and when it is corrupt, then the body moves to corruption by it – it is nothing other than the heart”. This statement is not a medical examination – not a cardiovascular assessment of the heart. For in Islam, the heart does not simply pump blood but it is a sensory organ. And when it is sound then the actions that the limbs commit will be sound – likewise, if the heart is corrupt, so shall the deeds committed be vile. It all depends on the state of the heart. 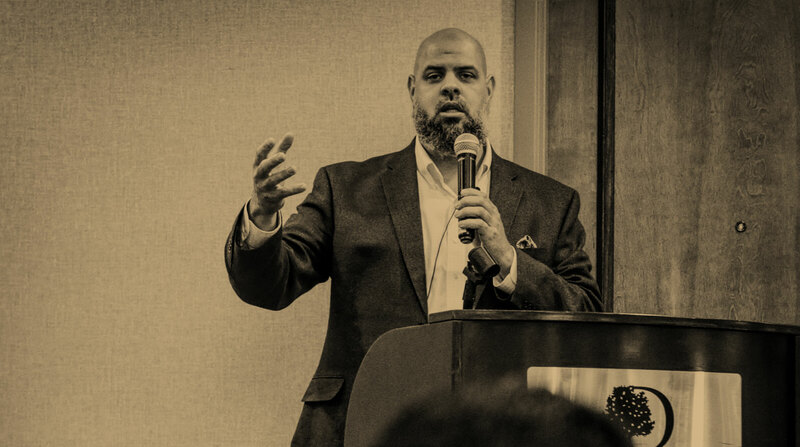 I have spoken before on the connection between responsibility and Reality – on the responsibility each soul will have on the Day of Judgment and the need to get in touch with The Reality [for one of God’s 99 Beautiful Names is al-Haqq, the root of which is a derivative for ‘reality’]. We can see the Wisdom of Allah’s early Revelation in which, through poetic metaphor, He alludes to another reality, His Reality, where the old misconceptions of the world have to be broken up and dispelled. The world as mankind came to know it was not based on Truth or Reality. We live in similar times today. These verses seek to show man that the world he thinks he knows is not the whole story – that there is another greater reality, one in which the life of this world will end, for Allah has ordained it. Dear brothers and sisters, the Paradise is real – the Fire is real – the Hour is coming, let there be no doubt about it. And Allah will surely raise whoever is in the grave. Let us now turn to Allah, ask His forgiveness, His protection from misguidance and from heedlessness, for He is Oft-Forgiving, the Loving. “And the agony of death will descend upon you in truth – for it is that which you seek to evade! And the Trumpet has been sounded – that is the Promised Day! Modern man strives to cheat or defeat death but there is not hope for this. Therefore, instead, let us inform ourselves and the rest of mankind of the life to come, to use the time in this life to prepare ourselves to the journey we all must take. For when we look at the above example, we can see there will be no excuse on the Promised Day – and all feigned excuses will fall aside, and our sight will bear true that which we wish might be concealed. Let us play the role we were sent to do – deliver the Message and live lives in accordance with the responsibility and cognizance of “No god but God”, in accordance of “Muhammad is the Messenger of God”, in accordance with the adab and akhlaq of the Prophet [s], seeking Allah’s protection from Shaytan and from heedlessness. Verily all praise belongs to God [known as Allāh in the Arabic language] – thus do we praise God, seek God’s Divine aid, seek forgiveness and repent our sins to and from God, and in God do we place our trust. We seek protection in God from the evil whisperings of our own souls as well as from blameworthy actions and deeds. For the one God has chosen to guide, there is no misguider for him. And as for one whom God has misguided, there is no guidance. And we bear testimony that there is no god but God, Allah, One is He, with no partner, Lord of lords, Causer of all causes, the Fashioner of the Seven Heavens, Creator of all that is. We also bear witness that Muhammad, the Unlettered Prophet, is His slave and messenger, Seal of the Prophets and most noble of the Messengers. May God send peace and blessings upon him, his family, his wives, his companions, his helpers, and his progeny. Surely God and His Angels send blessings upon the Prophet therefore O’ you who believe!, send prayers and blessings upon him abundantly. Surely, all praise is due to God, we praise Him, we seek His Aid, we ask for His forgiveness and upon Him do we rely solely. We seek protection in Him from the evil that resides within all of us as well as from the mischief of our own actions. As for the one that God chooses to guide, there is no misguider for him – and for the one that God misguides, there is no guidance for him. We bear witness that there is no god but God, know as Allah in the Arabic language, completely alone and without peer or partner, Lord of lords, Causer of all causation, the Fashioner of the Seven Heavens and the Creator of all that is. We also bear witness that out Prophet, our Imam, our leader, Muhammad, the son of Abdullah, father of al-Qasim, is his slave and messenger – the seal of the Prophets and most noble of the Messengers. May God abundantly send peace and prayers upon him and on his noble family, his wives, his Companions, his helpers, and his progeny. “Surely, God and His Angels abundantly send peace and prayers upon the Prophet – therefore O’ you who believe! Lavish peace and prayers upon him frequently. As we summarized, being tested is a part of life and how we react to those tests, how we react to God for being tested will determine the results of our test. This is all said to help understand and inculcate the proper adab or etiquette towards God. So we can recognize the authority of God by looking at His Creation. When we understand our proper relation with him, we may desist from petty bargaining with One-Who-Has-Everything. It is pointless to try and barter with One Who Has It All. God is clearly showing His Superiority over man and thus councils us to behave with that knowledge in hand. Being honest with God has many sides and facets for the human being to analyze and reflect upon. We mustn’t delude ourselves – we need God! And there are so many people out here in our society that need Allah, yet they may not know it. May Allah make us of the people of sincerity. We ask Allah to make us from amongst the people of good character and forgive us our sins. Amīn.